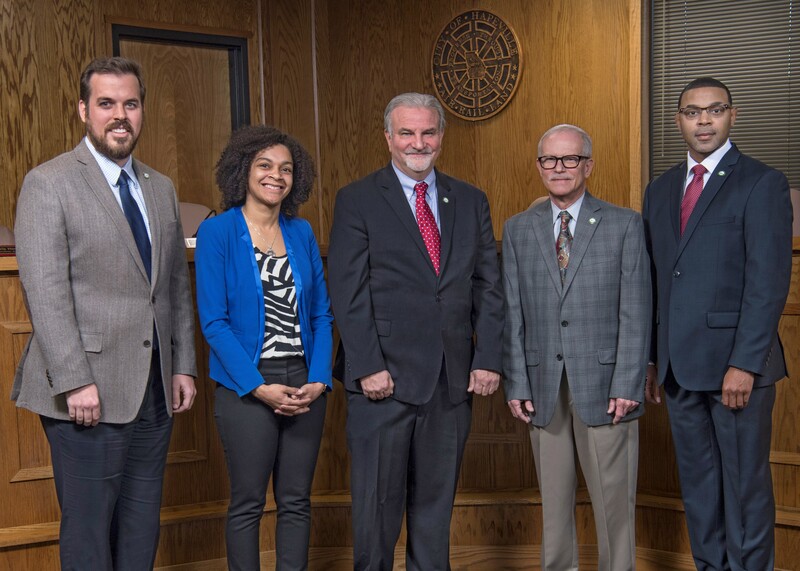 Hapeville Mayor and City Council Members photographed above from left to right: Councilman at Large Travis Horsley, Councilman (2nd Ward) Chloe Alexander, Mayor Alan Hallman, Alderman at Large Mike Rast, Councilman (1st Ward) Mark Adams. the Mayor and the City Council. Please visit the City Calendar for the up-to-date meeting dates, times and agendas for upcoming Mayor & Council Meetings. The affairs of the City are conducted by a Mayor and Council, which consists of five members. Under the City's Charter, all corporate powers are vested in the Mayor and the Council Members. The Mayor and Council Members serve four-year staggered terms in office. The City is divided into two wards, and two at large seats; however, the Council Members are elected by the voters citywide. The Mayor is the Chief Executive Officer of the City. The Mayor presides at the Council meetings and casts a vote only in the case of a tie.